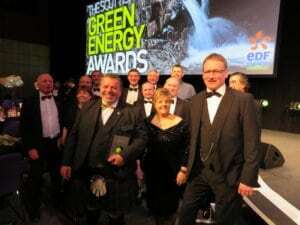 Dr Gareth Davies, Managing Director of Aquatera Ltd and Co-Director of Orcades Marine wins the prestigious “Outstanding Contribution” to the renewable energy industry at the Scottish Green Energy Awards in Edinburgh on St Andrews Day, 30th November 2017. Gareth has been publicly acknowledged for his dedication, innovation and determination to champion the renewable energy industry by deservedly winning the “Oustanding Contribution” award. Well done Gareth!